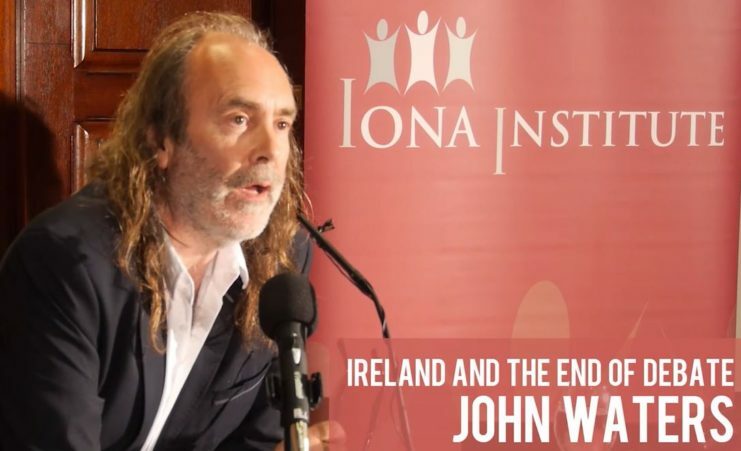 On June 9, John Waters addressed a packed meeting of The Iona Institute in the Davenport hotel, Dublin. His topic was ‘Ireland and the End of Debate’. In a wide-ranging address he described how the range of acceptable opinion in Ireland has become narrower and narrower over time. He said that rather than helping to open up debate, the media have largely been complicit in narrowing the terms of debates often through allowing voices that dissent from the secular, liberal consensus to be demonised. He said last year’s marriage debate very much illustrated that. His talk can be downloaded from here or by clicking the picture above. In this much shorter clip, John is asked, what can be done? He replies in the words of Pope Benedict, ‘The truth always has a future’.